Hope you all had very good Diwali. Mine went well and fired few crackers. Due to Diwali sweets/snacks preparation, I was not able to update few of the Diwali recipes in my blog yet. Also, I noticed I have not posted any non-veg recipes in my blog for some period of time. so, I decided to post few non-veg recipes first which were in my draft for some period of time, then I will post the remaining Diwali recipes. 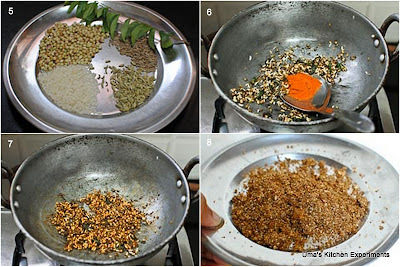 This is the recipe from my MIL which is prepared in south Indian method, goes well with steamed rice. However, you can also use as a side dish for roti/chapathi too. 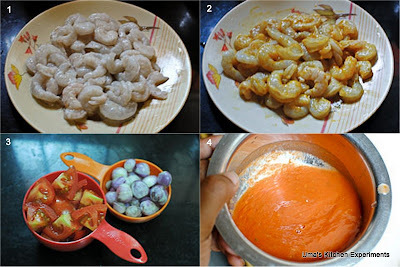 1) Wash prawns well in water for 2 to 3 times. Add salt, turmeric and a big pinch of red chilli powder. Mix well. Cover and keep aside for 30 minutes. 2) Meanwhile, in a heavy bottom pan, heat a teaspoon of oil. Add the ingredients except red chilli powder given under roasting and roast it till they releases nice aroma. 3) Turn the flame off and add the red chilli powder. The heat in the pan is sufficient for red chilli powder. At the same time, make sure not to burn it. 4) Allow it to cool and grind to a fine powder. If required add water to make a smooth paste. 5) Grind tomato and make a puree of it. keep aside. 6) Heat 3 tablespoons of oil in the same kadai / pan which we used for roasting. Add mustard seeds when it is hot. Add onion along with curry leaves. Fry till onion becomes very soft and translucent. 7) Add ginger garlic paste and fry till the raw smell goes off. 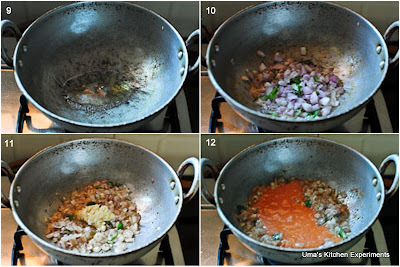 8) Add tomato puree and cook till it reduces and releases oil from the sides of the pan. 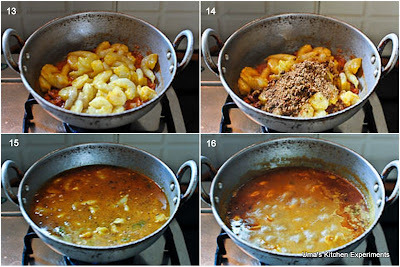 9) Now, add prawns, ground masala powder,salt, turmeric and water one by one. Mix gently. Adjust the salt and spicy as per your taste. When the gravy starts boiling, cover the pan and lower the flame to medium. Let it cook for few minutes. 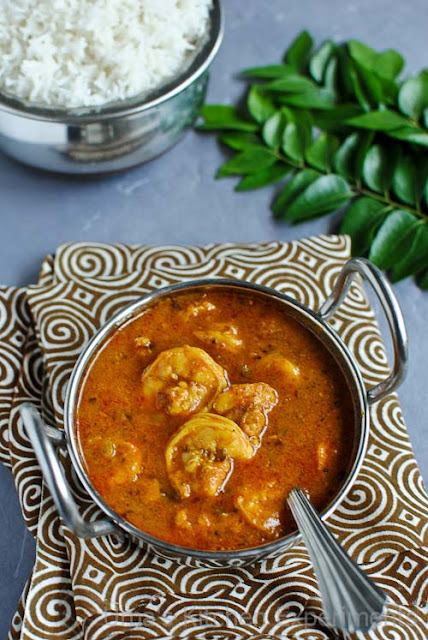 10) Cook the gravy till the oil oozes out from the top of the pan and the prawns are well cooked. 11) Garnish with chopped coriander leaves and serve hot with steamed rice. 1) Instead of red chilli powder, you can also use dry red chillies for roasting for this gravy. 2) Increase or decrease the water quantity as per your personal preference. If you like gravy consistency, then add a cup of water instead of 3/4 cup of water. 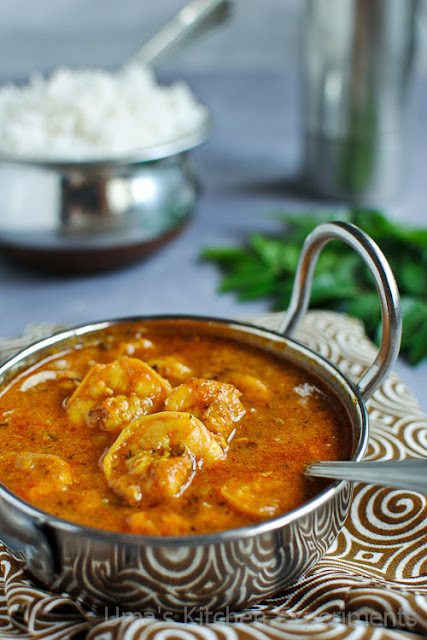 Wat a super flavourful curry, i do this prawn masala very rarely with all these spices,definitely a fingerlicking food. 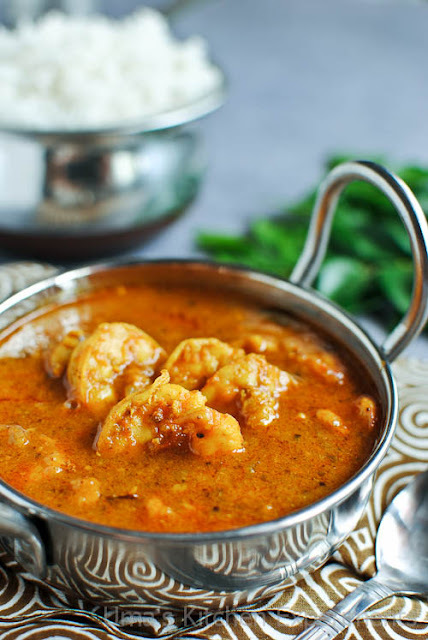 Hi Uma, this is my first time here and love your inviting prawn recipe :) being a non veg lover how can i not follow you :D your clicks are amazing. Hi Uma, this is simply mouthwatering.. I want some with the rice in the background! Lovely clicks dear :) Feel like grabbing that kadai :) Very well presented and very well explained too!! Tempting drool worthy curry,love the roasted masala. That looks delicious!! Will surely give it a try.. 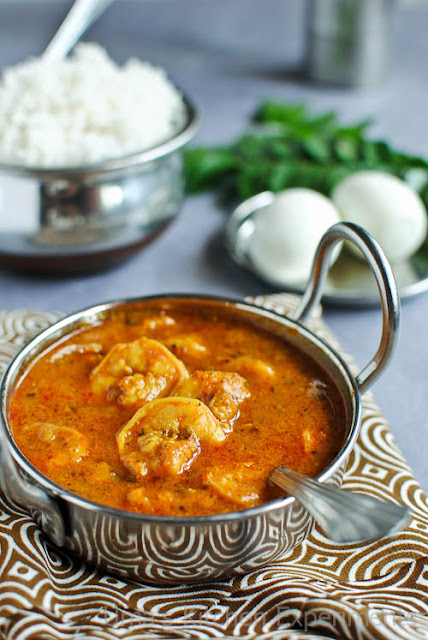 Tempting and delicious prawn masala curry..
Rice which we use for cooking. It is added to get thick gravy. 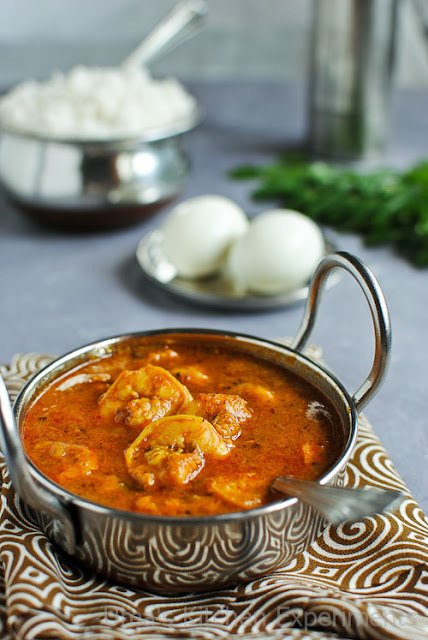 Hey - today i planned to cook Prawn and searched in google and I found yours. Let me try today and post the comments. Looks so yummy. Anyway thanks for your great Job. - Jayabal. Awesome awesome awesome! tried it today..loved the dish. Thanks for sharing. keep doing. well explained and good photo shots. 1 word - yuuuummmyyyyy!!!! thanx !!! I really enjoy prawns so I hope to try this recipe out. Thank you penji, nice clear explanation and great pictures! I am making this today for lunch! Looks good and easy, will surely try it. Going to give this a try today. How much is two strings of curry leaves for the uninformed?? Thanks. @shaun, it is about 10-15 leaves. Tried & tasted this recipe. Very different from our normal prawn chutney. Thanks Uma Romans jam for this tasty recipe. Thanks Veni for trying it and sending me the feedback. Can you be more specific about "rice grains"? Is that just rice that is cooked and then ground? What kind of rice? These instructions are incredibly confusing. Hi Anonymous, it is just rice. (without cooking) roast it till it is opaque and powder it. you can refer it the stepwise pictures. I can't find curry leaves, what can I use as a substitute! I can't make the powder as I don't have a grinder. What can I substitute? Are any of the powders available ready-made? Thanks. Hi... The gravy turned out yummy. Thank you for the recipe.